Quality Hotel Tønsberg is a modern family and conference hotel in Tonsberg. With its beautiful location and unique architecture, the hotel blends into its surroundings. We are a cash-free hotel. The Quality Hotel Tønsberg is a conference and recreational hotel combining the best in modern comforts and tradition in a coastal location. Enjoy modern facilities, a range of restaurants and a relaxation area with a pool. The hotel has state-of-the-art conference facilities with 25 conference rooms. We can accommodate a total of 1,000 people. The rooms are functional with modern conference equipment and technology. Thanks to our location next to Oseger House of Culture, we can help organise large trade fairs, AGMs, kickoff meetings, parties and other larger events. Read more about our conference facilities here. We love good food and beverages just as much as you do! Here at the hotel we have three restaurants and one bar, so come and enjoy a culinary experience in a beautiful coastal setting. The Quality Hotel Tønsberg is much more than just a conference hotel. Enjoy a calm and relaxing swim or an intense workout session thanks to our gym, relaxation area and rooftop pool (open during the summer from 1 June - 30 September). Use your room key to access the gym. 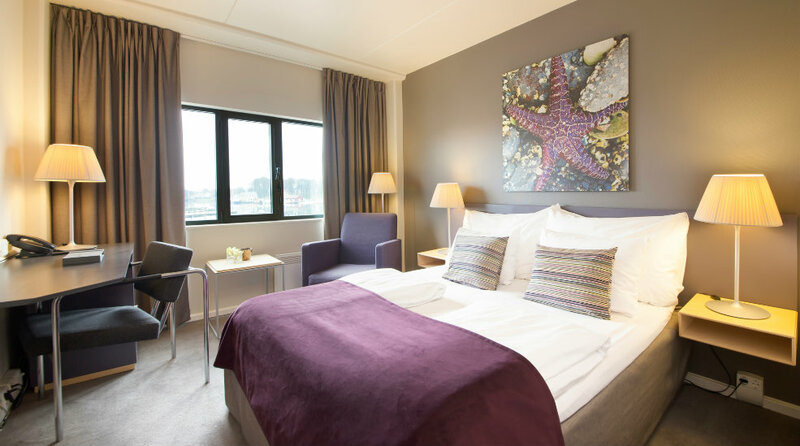 Quality Hotel Tønsberg is cash-free, which ensures added security for our guests and visitors. More information about this can be found under FAQs. Airport bus or train to Tonsberg station. Bus or train to Tonsberg station. Tonsberg station: approx. 5-minute walk.